This post is in honor of the stunning 3BR 2 BA custom-crafted timber-frame lake home I’m listing in Barnes, WI. It’s on crystal-clear, 55’ deep Bony Lake, which is part of the Eau Claire chain of lakes and connected to Middle Eau Claire Lake by a navigable channel. Just what’s the difference between stick-built, log, and timber-frame homes? What are the advantages and disadvantages of each construction method? 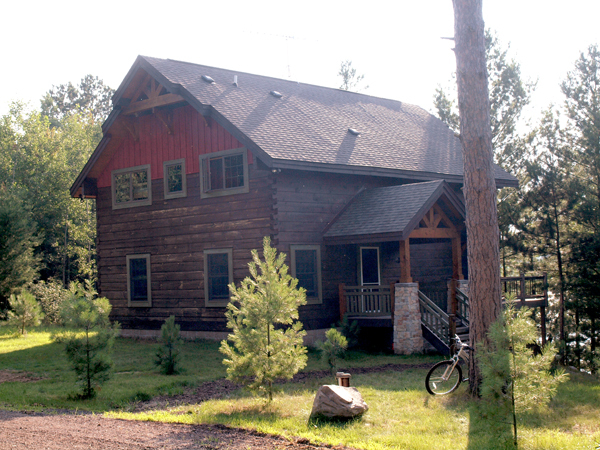 Are all log homes really log homes? And what’s the difference between a log home and a timber-frame home? What about homes that combine elements of both construction methods? For a quick overview, keep reading. Here in North America, nearly all homes are now built with light-frame construction that employs dimensional lumber, usually 2x4s or 2x6s. It’s a technique that allows builders to efficiently and economically enclose a large space with less material. You’ll sometimes hear these homes described as “stick-built,” especially when they’re being compared to mobile or modular homes. The term also makes sense when these conventional construction techniques are compared to log or timber-frame homes. Compared to logs and timbers, those puny 2x4s and 2x6s are just “sticks.” But put enough of them together in the right way, and you get a strong, durable structure that’s relatively easy and economical to build. So it’s no wonder “stick-built” has become the default residential construction method in much of the world. Sometimes it’s just called “normal” or “conventional” construction. Still, here in Northwestern Wisconsin we do see a fair amount of log and timber-frame construction. Some examples are older, relatively modest homes that were built before these designs became newly fashionable. Most, however, are high-end lake homes whose owners chose these construction methods because they appreciated their aesthetics and craftsmanship. Apart from cost, these building techniques have very few disadvantages—and often some real advantages that go way beyond aesthetics. But the first thing you should know about log homes is that many of them aren’t really log homes. They only have log siding. It’s shaped like half of a log, and it could be exactly that—half of a log that’s been sawed lengthwise. Or, it could be a thin veneer of wood over a foam core that’s lighter and more insulative. Not that there’s anything wrong with either method; these are fine stick-built homes with very attractive siding. From a distance, or even up close, most people won’t notice the difference. Purists, however, may opt for a home whose outer walls—and maybe even some interior walls—are built from actual logs. Real logs, carefully joined together and placed one on top of the other, are more than just decorative. They’re structural. The same construction method the pioneers used to build their tiny log cabins has now been adapted to the construction of luxury lake homes that are far more spacious. Although the logs are larger and builders use giant cranes to lift them into position, the basic concept is the same. Log homes can be beautiful, solid, stable, energy-efficient, and built to last. They do cost more to build than a stick-built home of the same size. But for buyers who appreciate the result, it’s worth every penny. Aesthetically, these homes have a special appeal. And spatially, their interiors typically feature much larger open areas than you’d see in a stick-built home. Because the outer walls and large beams do more to support the structure, the interior needn’t be interrupted by as many load-bearing walls. All these statements are equally true of timber-frame homes, which are generally built from squared-off beams that are much heavier than 2x4s or 2x6s. Typically these structural elements might be 6” or 12” thick, with a square or rectangular cross section. When it comes to exterior walls, timbers are simply squared-off logs. But true timber-frame construction also features interior posts and beams as major structural elements that make possible an especially open, airy floorplan. For a more rustic look, these interior beams are sometimes left rounded; that’s one of those places where the lines between log and timber-frame construction might blur a bit. Traditionally, timbers were carefully fitted and joined together with large wooden pegs, similar to the mortise-and-tenon joints in furniture. Although that’s still done today, you may also see joints that are reinforced with steel gusset plates and giant bolts. In practice, many homes include log walls and timber-frame construction. ( Hmmm… If the outer wall is built from timbers, but each timber’s outer face is left rounded, then is the wall built from logs or timbers? And what about log homes with an outer face that’s been squared off?) And for most interior walls, of course, these homes still use traditional stick-built construction. Other homes are mostly stick-built, but include a few beams and timbers whose purpose is both aesthetic and structural. So again, sometimes the lines between these categories can blur a bit. For a great example of a home that incorporates true timber-frame construction both inside and out, check out this stunning, custom-designed luxury lake home on Bony Lake in Barnes, Wisconsin. Crystal-clear, 55’ deep Bony Lake is part of the Eau Claire Chain of Lakes, and is connected to Middle Eau Caire Lake by a navigable channel.